Roosevelt dimes have been minted since 1946. Up until 1964, the coins had a 90% silver content, which makes them a very popular form of silver for both investors and collectors. The “Roosies” offered here are in “average circulated” condition and they are expected to conform to the industry standard of 715 troy ounces of silver per $1,000 in face value (0.0715 oz per coin). 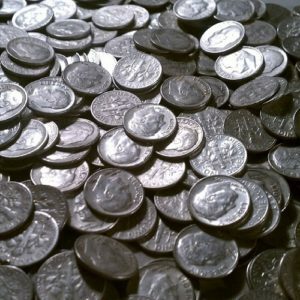 It may be worth noting that 90% Silver Roosevelt Dimes tend to have less wear than Mercury Dimes as well as a lower premium above spot price of silver. That means more silver for less money! Don’t be fooled by the term “junk silver”. These aren’t junk at all. The term came about simply to signify that the coins have no special collector or numismatic value, although some “key dates”, in certain grades are worth a bit more than the “common dates”.